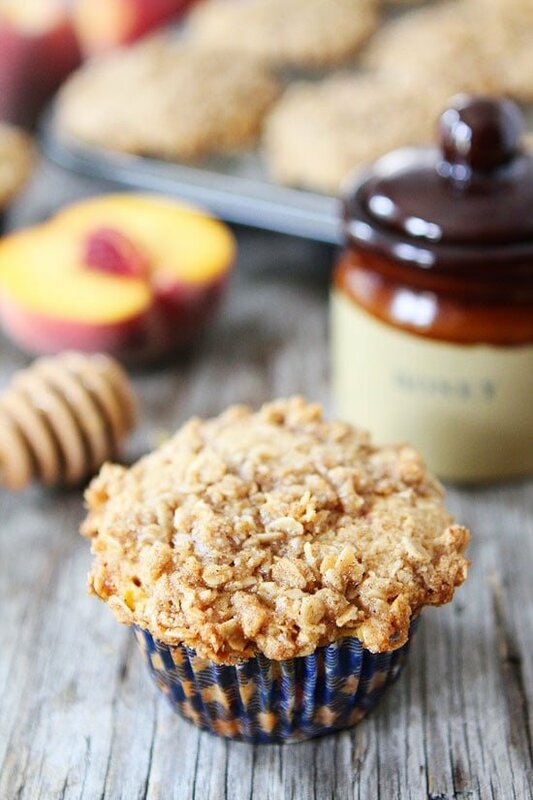 Honey Peach Muffins with Oat Streusel Topping-whole wheat muffins with juicy peaches and a sweet oat streusel topping! These muffins are a new family favorite! I’ve been on a muffin kick. Caleb loves muffins so I have been making them for him, or at least that is what I am saying. I am enjoying the muffins too:) Yay for muffin madness! 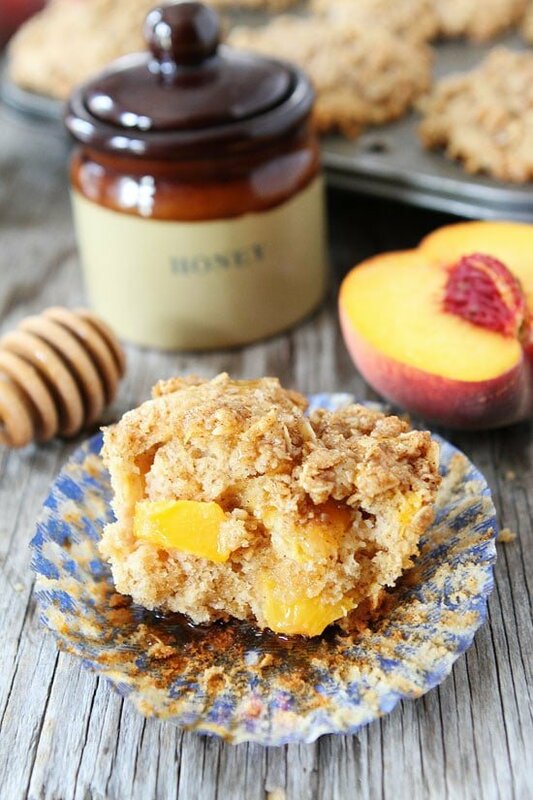 I am head over heels in love with these Honey Peach Muffins with Oat Streusel Topping. I made them on a whim because I needed to use up the peaches from our tree, but they are now a favorite muffin recipe at our house. I loved them and so did my boys. Well, Maxwell didn’t get a bite, but I am sure he will love then when he gets older. “Sugar, oh honey, honey!” I don’t know why but that song is in my head. Oh wait, I do know why because I used honey to make these delicious peach muffins and now I can’t get the song or the muffins out of my head! Love the song and love the muffins! Anyways, I made these muffins on a weekday morning when Maxwell was napping and Caleb and Josh were at the park. They came home to a muffin surprise! We all sat down and enjoyed a mid-morning muffin snack. 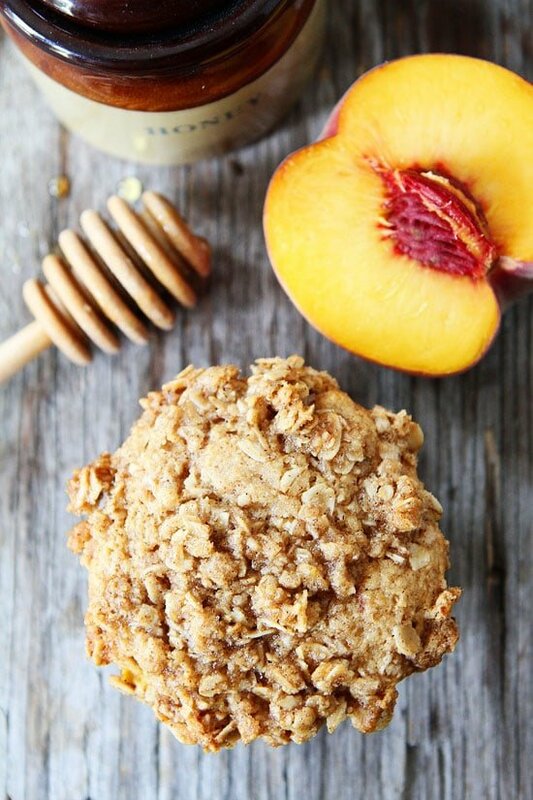 The whole wheat muffins are sweetened with honey and have chunks of fresh juicy peaches inside! The muffins also have a glorious oat streusel topping. Streusel makes everything better! We all devoured our muffins and Josh even grabbed a second. I refrained from having a second muffin…for about an hour. Then my muffin mind got the best of me and I ate another one! 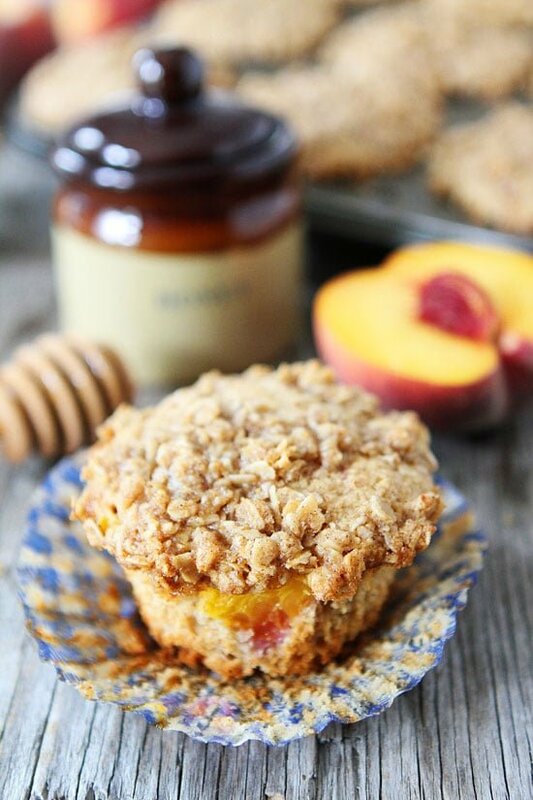 Whole wheat muffins filled with juicy peaches and covered with a sweet oat streusel topping! These muffins are a MUST make! Preheat oven to 375 degrees F. Line muffin pans with paper liners or coat with cooking spray. Set aside. 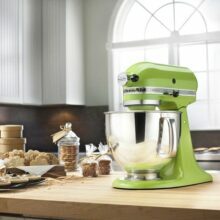 In a large bowl, whisk together flour, sugars, baking powder, salt, cinnamon, and nutmeg. Set aside. In a small bowl, whisk together buttermilk, butter, honey, egg, and vanilla. Pour the liquid mixture over the dry ingredients and stir until flour disappears. Gently fold in the peaches. Fill muffin cups 3/4 of the way full. Sprinkle each muffin with oat streusel topping. Bake for 18-20 minutes or until a toothpick stuck in the middle comes out clean. Let cool for 5 minutes. Serve and enjoy! Thanks Maria for the nice muffin recipe. Sounds really good and I love peaches. Ohhhh, I love a good fruity streusel topped muffin! yum! haha- thats so funny..I totally bake “for Kay” too ;). These look so yummy! Streusel topping?! YES! They sound delicious, and I just happen to have some peaches that need using up. Do the muffins freeze? Yes, you can freeze the muffins! 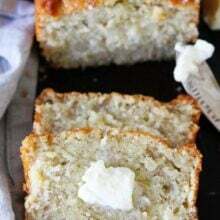 Hey there this recipe looks amazing, the only thing I’m missing is the whole wheat flour can I substitute for all purpose flour? Yes, you can use all purpose flour! These muffins are fall fabulous!! Oh my, full of flavor, and textures. This will be really nice when we go camping on the weekend. I can just smell these cooking next to the fire. I want these muffins for breakfast tomorrow! They sure look fabulous! This is my kind of muffin! The streusel topping is irresistible! Yay! Glad you made them! Wow! And I love that you can freeze them. 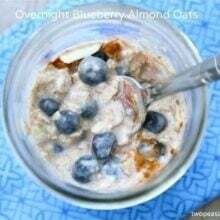 these are calling my name for breakfast tomorrow morning! Long long long ago when the world was flat and I was in high school I use to make a similar muffin. It was sooooooooooo good. I had forgotten about it. How lovely to be reminded. These look delicious! I love peaches. Not sure why, but reading this post made me so happy–like, euphoric, for no apparent reason. Have a great week! Do I need to store these in the fridge? I store them on the counter in an airtight container. Streusel does make everything better! Also, I’m super jealous that you have a peach tree. These look so good! I love peaches in everything! Just made these muffins today and they are hands down the best muffins EVER! I topped them with your Almond Streusel Topping instead of the Oat version (because I had almonds in the pantry) and we love them. Thank you so much for sharing your recipes us!!! What a delicious treat to come home to! Peaches drizzled with honey are a favorite here and to put them into a muffins sounds perfectly divine! Thanks for sharing the recipe! what’s the raw sugar exchange? If I used the honey we would need a house full of epi pens. I don’t know how to cook without a little singing in my kitchen 😉 These muffins look awesome! I need to make these now! These look so yummy! 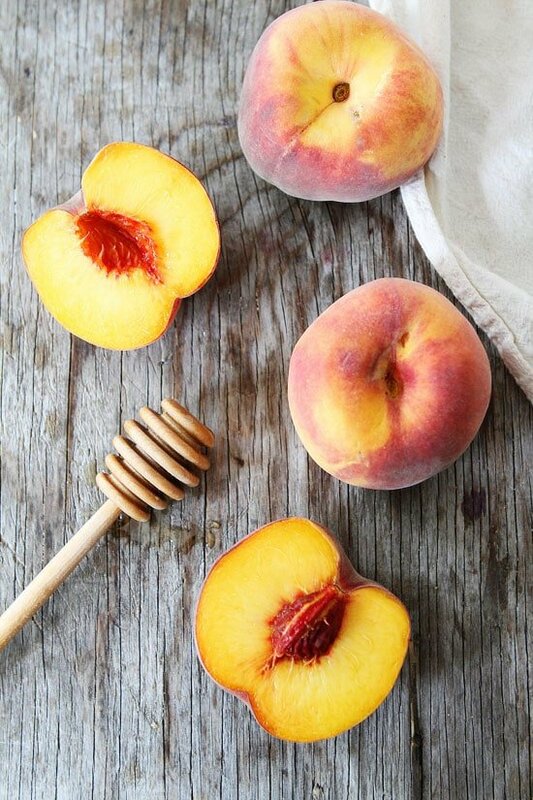 Love when peaches are in season! My daughter and I made these the day the recipe came out. I subbed 2% milk and a T of apple cider vinegar b/c I didn’t have buttermilk and I used frozen peaches. These are some of the best muffins we have ever made – thank you for the delicious recipe!! We also froze them and they are delicious warmed up for a snack on the go. These look wonderful! I’ve been on a peach kick recently and could really do with making some muffins, I haven’t had them in ages!! Ooh, these muffins look so yummy! I never want peach season to end. Saw these last night and made them this morning. I’m always looking for good muffin recipes that aren’t just cupcakes and these were so, so good! Probably the best muffins I’ve ever had. I reduced the sugar slightly and they were still delicious. I also very finely chopped the peaches so my son who doesn’t like them wouldn’t notice. He did but liked the muffins anyway. Thanks for the AWESOME recipe!!! I am guessing I could mix half ww/half ap flour? I have a whole bunch of peaches to use up so this should work great! This looks so amazing! I can’t wait to try this for my family this weekend. Thank you for sharing! These look just divine! Sharing on Twitter & Facebook with my handful of followers. 🙂 Thanks for sharing your recipe! The flavor and texture of the muffins were really good, but man, did they stick to the paper liner. In hindsight, I wish I had greased the pans instead of using the paper liners. Aside from that, we were fans. Thanks! Was looking for a muffin recipe to use my peaches in and found this!! It was just what I needed. I forgot to grease my silicone muffin cups so they kind of stuck but my daughter found a way to work around that. Jessie dumped the muffin out of the cup on to a plate so it looked some what like a crisp and added sweetened yogurt on the side! Will is always looking for a sweeter option so I added ice cream for him! It was a fabulous treat, thanks so much for the great recipe!! Didn’t think that these were great. Not much flavor. Maybe would have liked them better with white flour. These were great! With 2 kinds of sugar + 1/4 cup of honey, I thought they’d be sweet enough so I skipped the streusel and topped with oats prior to baking. I’ll definitely make again.